Kids who love Frozen owe a big thank-you to the Disney staffers who made 101 Dalmatians. Animation had grown to be such an expensive proposition that it took 600 people to bring the previous film, Sleeping Beauty, to the big screen in 1959. 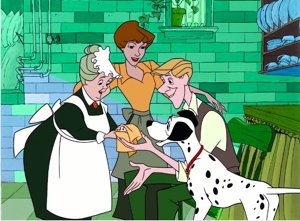 And so the folks who worked on 101 Dalmatians were told that they had to find a way to make an animated picture that didn’t cost so much, or Walt Disney would reluctantly pull the plug on all future animated projects. The animation staff had already been trimmed to 300, but that still wasn’t enough. What saved animation for Disney was the discovery that you could eliminate the step of “inking” the drawings by Xeroxing them directly onto acetate sheets and save one tedious and expensive step in the animation process. That’s the backstory, but what everyone knew in 1961 was that Disney had come up with another winning animated feature that included one of the most memorable Disney villains to date: Cruella De Vil, a devil of a woman who even had her own catchy theme song. She couldn’t change herself into a dragon, like Maleficent, but her driving was frightful and her obsession—to turn cute little Dalmatian puppies into a fur coat—was as evil and monstrous as any scheme that young viewers could comprehend. Even her henchmen were memorable because they combined comic relief and true menace. 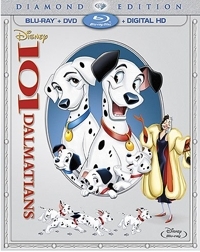 101 Dalmatians turned out to be the ninth highest grossing film of 1961, and while it didn’t do as well as two Disney live-action features (The Absent-Minded Professor and The Parent Trap), it kept Disney animation alive for future projects and future generations of viewers. Arthur will probably never catch its PBS cousin Sesame Street, which, at 44 seasons, is the longest running children’s show in America. But at 18 seasons it still holds the distinction of being the longest running animated children’s show in America. 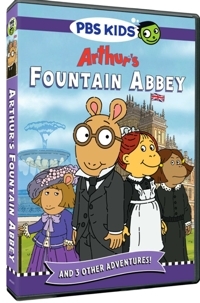 Based on the books by Marc Brown, the series star is Arthur Read (the last name is deliberate, since the series encourages reading), an eight-year-old anthropomorphic aardvark who lives in a world of animals that walk, talk, dress, and face the same problems as their human counterparts. He’s a responsible kid who comes from a good family, and the series shifts back and forth between friends and family life with parents David (a chef/caterer) and Jane (an accountant who also works at home), and Arthur’s two younger sisters—the often annoying preschooler D.W. (short for Dora Winifred) and the infant Kate. Arthur is a third-grade student at Lakewood Elementary, a likable brainy kid who isn’t marginalized the way some studious or brilliant kids are, and is made more “average” here because one of his friends is called “Brain.” He’s also friends with an exuberant rabbit named Buster and a not-so-bright burly dog named Binky. The emphasis is often on problem-solving, and reading sometimes provides a means of getting to that end. But Arthur is also good about addressing serious issues in a soft-but-firm way, or crafting episodes that are rooted in the headlines and popular culture. Disney is high on Studio Ghibli—otherwise they wouldn’t have contracted to release all of the Japanese animation studio’s titles on Blu-ray for U.S. audiences. While anime won’t appeal to everyone because of the distinctive-but-strange style and storylines that meander a bit more than American audiences are used to, Porco Rocco might be the exception to win over families . . . at least those with older children. When I say “older,” I mean teenagers who have some sense of history and can appreciate the film’s basic premise. 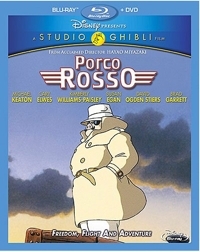 The title of this feature alludes to The Red Baron, and Porco Rosso (1992) is as heavily atmospheric as it is quirky. It plays out like a post-WWI movie about fighter pilots or an ill-fated love story like Casablanca, and there are tropes here that we recognize—like the jaded, 1920’s hero who carries the weight of being the only pilot to survive the biggest dogfight of all during WWI, and who resembles a trenchcoat-wearing Sam Spade or any other tough-talking, drinking and smoking private eye. Aside from a knock-down, drag-out fistfight, there’s not nearly as much violence (or drinking or smoking or swearing) as you’d expect for a film of this sort. That’s because director Hayao Miyazaki loves magic almost as much as he loves airplanes and realism, and Porco Rosso has elements that would qualify it as a magical realist work of art. 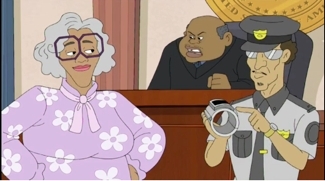 The old lady with a heart of gold who wants everybody to be nice and successful and respectful and play by the rules stands in sharp contrast to the thuggish grandma who has a quick temper and breaks laws just as readily as she’ll break your face if you backtalk her. That contradiction is apparently one of the reasons Madea is somehow beloved by so many. But you do have to accept the contradiction, because it’s a part of every Madea movie . 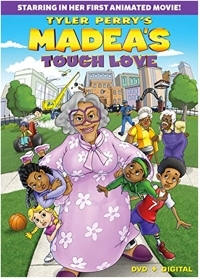 . . even her first animated feature, Madea’s Tough Love. 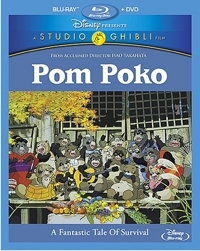 Based on an idea by legendary Japanese filmmaker Hayao Miyazaki, Pom Poko is the story of a community of shape-shifting raccoons who struggle against developers that tear down forests and natural habitats to build stacks upon stacks of new subdivisions. It’s a solid film from director Isao Takahata (Grave of the Fireflies, The Tale of The Princess Kaguya)—one that may strike Western viewers as having at least four “endings” where the film felt neatly wrapped up but then kept going, and in another direction. The runtime is only 119 minutes, but it frankly felt longer because of those false endings, which can also make the film seem like an episodic patchwork. There’s always something a little hokey about movies made for children to watch with their parents—kind of like Norman Rockwell paintings that depict life, but also simplify and idealize it. There’s a cheery afterschool special tone to them that resists any comparison to reality as we know it. Then again, when something in that facile genre gets an infusion of talent and its heart is in the right place, it’s tough to find fault. That’s how I felt watching A Little Game, which struck me as Karate Kid plays chess instead of learning martial arts. 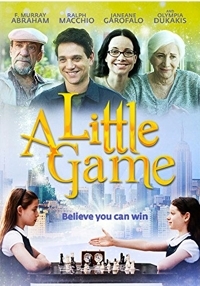 It struck co-star Ralph Macchio the same way, only in this 2014 film from Arc Entertainment he plays the dad rather than the kid in this coming-of-age story. In a bonus feature that mixes interview clips with behind-the-scenes NYC shooting footage, Macchio admits it’s just like the Karate Kid. And playing the Mister Miyagi role brilliantly is F. Murray Abraham as an irascible chess master who spends his time in Washington Park playing pick-up chess games for money. He has a background that we assume is impressive, though it’s never really stated. Like Pat Morita in Karate Kid, he also has a roundabout way of instruction that teaches his pupil as much about life as about the game itself. And as in Karate Kid, his pupil is bullied and feeling lonely and ostracized. Chess becomes a focal point that changes everything. I know what you’re thinking. Chess??? That slow-moving Rook-to-A-3 strategy game of intellectuals that’s been around since the 6th century? Yep. Part of the fascination comes from the way that chess master Norman Wallach teaches—insisting, in true “wax on, wax off” fashion, that his pupil learn step by step and discover things in the city that will help her to understand the moves on the chess board, and part of the fun comes from Norman’s cranky personality and feisty exchanges with a precocious 10 year old whose parents let her ride the subway by herself. The real test of a movie in our household is whether one or all of us want to add that film to our collection so we can watch it again. And 15 minutes into The Pirates, my teenage son was cracking up and saying, “This is a keeper.” I second the notion. But I’ll tell you right now, your children have to be good and confident readers to enjoy this South Korean comedy-adventure, because it’s presented in Korean with English subtitles, and there’s plenty of fast-talking action. 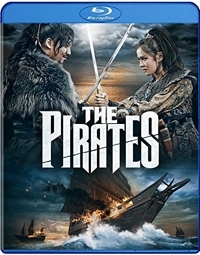 Director Lee Seok-hoon pays obvious homage to the Pirates of the Caribbean franchise with a slick comedy-adventure that features a Johnny Depp-like bandit leader known as Crazy Tiger (Jang Sa-jung) and a female pirate chief-turned-captain (Son Ye-jin). There are funnily harrowing escapes and even a giant water wheel that rolls through a marketplace, all of which will remind you of Captain Jack Sparrow and Elizabeth Swan.